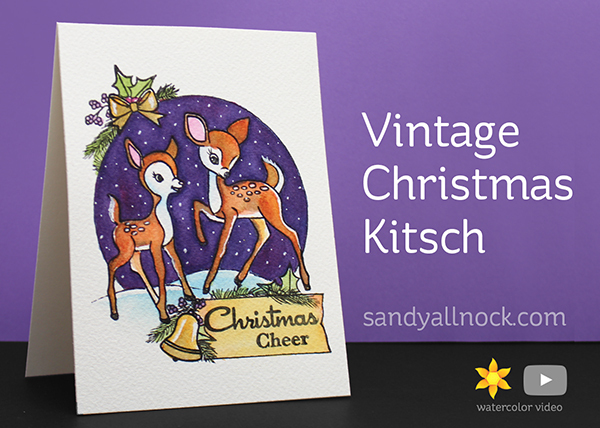 I was inspired to look at some vintage postcards to figure out a layout for this card…I stamped the deer, added the circle in pencil, then stamped the greens (masking where needed), then drawing in the banner and circle with a black sharpie (waterproof pen). I had some challenges with the purple background, but it was sure a fun experiment – and this is one of my fave cards lately! Watch the video below or click HERE to see it in HD on YouTube. So cute and love the video and your thought process. Gorgeous night sky for the cute deer! So amazing to watch. I like that you show the progression and change your own mind as you go. THAT’S why I need to try! A beautiful card Sandy! perfect card and I love deer. I don’t know why you say it’s not perfect. Looks perfect to me! Very charming card. Also….oh, OK, now I know why I get those blooms. Thanks! Very cute! loved the process as well as the finished card. AW these are the deer that I fell in love with as a little girl. Of course, I loved Thumper, too! Great background. The deer are so cute. It was so much fun watching you change your mind about that background. Love the way it turned out in the end. I love this card. the deer are adorable. 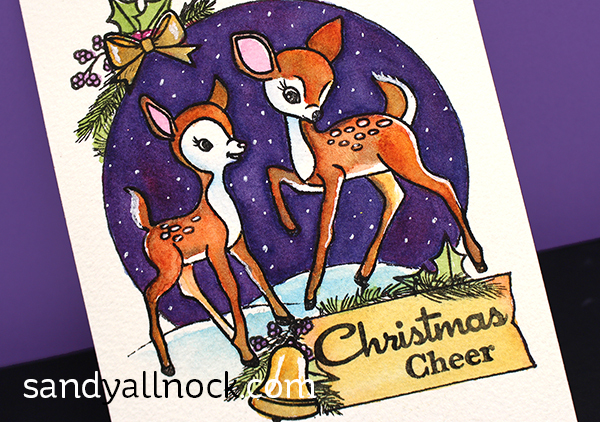 I just did a couple of cards with these deer on a plain white background and copics with diecut holly, berries and sprigs …..now i will do a couple of these on watercolor paper and try to do the circle, holly, berries and ribbon like yours. Thanks for the different layout and watercolors! Oh how pretty when you dropped the pink into the blue! Those deer are just so Bambi-esque! Thanks. I have this set. I would have never thought of purple! I actually have 4 deer colored. Maybe I’ll do something with them now! Lovely card! And I enjoy hearing your thought processes that go on while you’re painting! Awww … Super sweet card! The layout and images work beautifully with your intense coloring. I always learn so much from your videos, Sandy. I love the background you created, & I enjoyed watching the process of how you achieved that look. Those stamps are great, & I may have to get them & save them for next year”s cards.